Wii Madden Cup: Your Worldwide Leader in Wii Madden Tournaments. -You will be awarded a set number of points based on how you place in tournaments and perform in the regular season. -You're free to join as little or many of the tournaments and regular season as you wish but the more you play the more points you'll rack up. 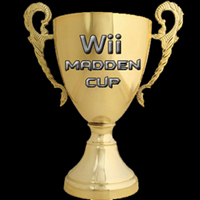 JOIN Wii Madden Cup Today to max out on fun for your Wii Games!!! $4.33 is all we need to get a subscription to League Daddy! Please donate today! Set up exhibition games for the week here. All games must be set up and agreed upon here to ensure there's no disagreements about what games count towards points and what games don't. To set up a game start a new post. The Subject of the post should be you and your opponents name. In the Message body of the post include when you plan to play. Before playing make sure both members have agreed to the rules of WMC here..
One person should post the score and the other person should reply that they agree to the score by quoting the first person.. Here's an example of what it should look like..
» Tournament #2 Sign-ups: No rushing plays tournament (All passing plays must be called). » THIS SITE IS DEAD : Join MLM Today!!! » ANY TAKERS? 15th and/or 16th of Sept.
100% of Donations made to Wii Madden Cup will be put directly back into the site. Our first planned purchase is League Daddy.